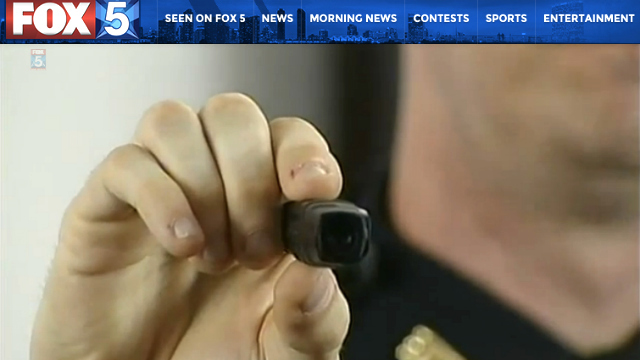 Body cameras worn by San Diego police are working and defusing situations, San Diego police chief said. Image via Fox 5 San Diego. The presence of cameras on the uniforms of San Diego police officers appears to be defusing many tense situations with the public, Chief Shelley Zimmerman reported Wednesday. Zimmerman told the City Council’s Public Safety and Livable Neighborhoods Committee that in the last six months of 2014, complaints against officers dropped 40.5 percent in three divisions where the cameras were deployed, compared to the first six months of that year. The number of individual allegations contained in complaints was reduced by about 60 percent, she said. “Officers and sergeants have also said, on several occasions, when a citizen indicated that they wanted to make a complaint about an officer and when the citizen was told that the incident was captured on video, that in many cases they no longer wanted to move forward with their complaint,” Zimmerman said. “Several were shown the video on the spot, and they had indicated to the officer or the sergeant that they may have overreacted in initially wanting to make the complaint,” Zimmerman said. The chief added that in a three-month period at the end of last year and early this year, the need for officers to use force against an individual, such as with their hands or knees, dropped 46.5 percent, compared to the same period one year earlier. Officers also reduced the use of pepper spray by 30.5 percent, she said. In the three-month study period, assaults against officers climbed from 40 to 41, she said. However, the rise was attributed to an increase in calls for mental health issues, along with more drug offenders being on the street after last year’s passage of Proposition 47. Around 600 cameras are in use by SDPD officers. They were rolled out first in the Central, Mid-City and Southeastern divisions, and have since expanded to the Northern, Southern and Western divisions and the gang suppression team. Other divisions and traffic cops will get them later this year. The devices work by recording in a 30-second loop at all times. When about to initiate a contact with the public, the officer pushes a button that not only records the interaction but saves the half-minute leading up to the event. The recordings are downloaded at police stations at the end of an officer’s shift. Zimmerman told the committee members that detectives and prosecutors have found the recordings to be useful when cases proceed to court.